NEW PRICE! Fantastic contemporary home and move-in ready! 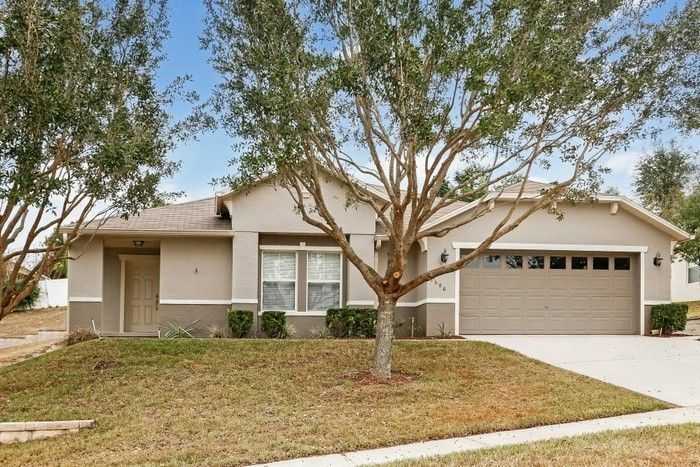 This VERY well maintained property has a great central location in Clermont! Situated in the community of Lakeview Pointe with convenient and close distance to shopping, restaurants, Lake Hospital, VA Medical community center and walk to NTC (National Training Center). Built in 2006 by “KB Homes” and features a single-story floor-plan with 3 bedrooms, 2 bathrooms, 2 car garage, a great room design with an open kitchen concept, large laundry room and split bedrooms. Enjoy a big custom kitchen with an island, snack bar, closet pantry, stainless steel appliances, smooth range top and a built-in oven and microwave! Comfortable 18x15 master suite with a walk-in-closet and master bathroom also features a shower with a separate garden tub and dual sinks. Other great features include mature trees, irrigation system, 6 panel doors, tile in wet areas and a security system! Virtual tour available.